Visit us at hall 8, booth N22! Europe’s leading business platform for network operators and content providers will present all things broadband and audiovisual content at Koelnmesse from 12 to 14 June in Cologne, Germany. 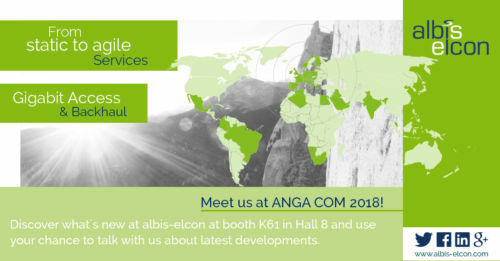 More than 500 exhibitors will participate at the ANGA COM this year, including albis-elcon.In addition to the latest product innovations and exciting conference panels, there will be interesting discussions about the technical developments of the future like for example Network Function Vitualization, Software Defined Networks and Orchestration – also at our booth. albis-elcon will also be showcasing their latest products and solutions in the areas of Network Migration, IPTV, Energy Management, Gigabit Access & Backhaul and Network Management. Some of the devices are even installed in a live demo rack, for example the All-In-One Business Access Device BIG 2862, the ACCEED 4420 for 10 Gigabit Ethernet aggregation, the Remote Power System RPS for Energy Management, all monitored and controlled by our MetroIntegrator management software. We offer cost-optimized products and solutions for specific services that exactly meet customer requirements – just like yours. Convince yourself and visit us at booth K61 in hall 8 and let us demonstrate how we can complete your network. As a special feature and to match the Soccer World Cup in Russia, we have albis-elcon footballs for our booth visitors at the ANGA COM. What do you have to do for one? Follow us on one of our social networks, let us take your time while you inflate the ball as fast as you can and you’re already the proud owner of a special, limited edition albis-elcon football and optimally equipped for the soccer season 2018. In addition, you have the chance to win 2 VIP Lounge tickets for an RB Leipzig football game. The winner of the tickets is the one who holds the record inflating time on the last day of the show, 14th of June, at 3 p.m.Awaken your ambition and take part, it is worthwhile in any case!